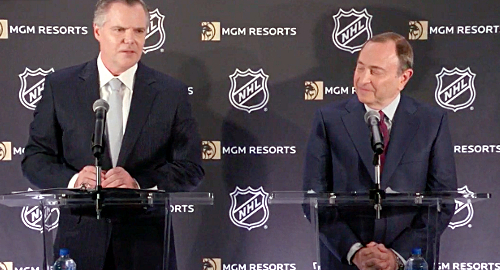 On October 29th, 2018, NHL Commissioner Gary Bettman and Chairman and CEO of MGM Resorts Jim Murren held a press conference announcing a multi-year partnership designating MGM as an official gaming partner and resort destination of the NHL. The NHL becomes the second of the Big 4 leagues to do this, following the NBA’s lead when they made a similar deal in July. The details of the partnership still remain somewhat unclear, and there’s some ethical issues that need to be addressed to help fans better understand it. Here’s what needs to be known before fans can start betting next season, as well as the basic rundown of the partnership itself. In an agreement dubbed “historic” by Murren, and “exciting and groundbreaking for [the] League” by Bettman, MGM is now allowed access and use of the NHL’s intellectual property, including all brands and trademarks such as team logos, as well as player data currently being developed and tested by the League itself. Additionally, all estimated 31 million members of MGM’s M Life loyalty program will earn special access to MGM-sponsored programs at major NHL events, such as the All-Star Game, Stanley Cup Final, and the yearly NHL Awards, held in Las Vegas. This partnership does not bar the NHL from entering into other agreements with other sports betting entities either, so expect more deals to follow suit, probably on a team-by-team basis, where teams could implement sports betting lounges into their home arenas. That’s pretty much the run-down of the deal to date, with more details to follow when the NHL elaborates on what kind of player tracking data they are going to be providing to MGM next season. Now, for the ethical implications of the partnership. In the ripple of this momentous partnership, the most worrisome aspect of it all is the ethics behind it. That is, from a fan’s perspective, and even from a player’s perspective, what does a resort and sports betting giant having access to all of this League’s intellectual properties and all of its players’ data mean for the integrity of the game? Commissioner Bettman assures the fans that the integrity of the game is not in danger now or in the future, and that he has full confidence in MGM to uphold their side of the bargain. Bettman also mentioned in his press conference that hockey is essentially “too hard” to fix, even with legalized sports betting now in effect. 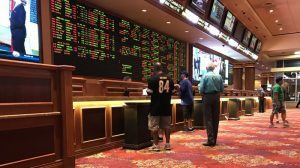 It’s no surprise that the NHL pounced on the opportunity to establish a presence in the young world of legalized sports betting; after all, they do boast the bragging rights of being the first of the Big 4 Leagues to establish a team in the city of Las Vegas. And, the NHL’s relationship with Las Vegas (and MGM Resorts) doesn’t end there. The MGM Grand Hotel & Casino hosted the 2015 NHL Awards, and the NHL has held the Awards in Las Vegas at different locations every year since, as well as in years prior. MGM is also part-owner of T-Mobile Arena, home of the Stanley Cup Finalist Vegas Golden Knights, the League’s newest team. The NHL wanting to make the most out of the untapped market potential in Vegas is nothing new, and this is just another step in the process. Another ethical issue is the revenue that is going to be generated by this partnership, and where it will go. The agreement on revenue in this partnership is interesting; actual bets placed will not drive League revenue, instead, the revenue is fixed, meaning that it is not affected by bets, and will be a set and steady income. 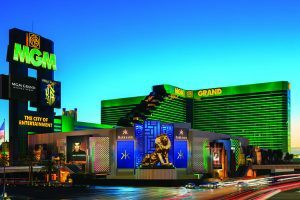 MGM stands to gain more money-wise from this partnership, as the total monetary amount wagered in Nevada per a 2017 report came out to around $4.87-billion. The NHL should still expect an increase in League revenue upwards of $200-million, however. And, the catch on this revenue is that it’s considered “hockey-related revenue,” which means that, per the current Collective Bargaining Agreement, team owners and players will get to split the money 50/50. The most prominent ethical issue surrounding the partnership is undoubtedly the data the League will be sharing. As for what the NHL could potentially provide to MGM Resorts on this front, some traditional methods like fixed odds outcomes and over-under predictions could be affected positively, as there will be much more data to back up fan wagers. As for player bets, no one is really sure what to expect, or how advanced they will be. Should we expect to be able to bet on if a specific player will score a goal in the first period? Should we expect to be able to bet on if a player will notch a 20% shooting percentage in a game? Will we be able to bet on if a player will record two secondary shot assists from a low-percentage scoring area on rush plays? Who knows. That’s exactly where the uncertainty comes from: exactly what player data MGM is going to have access to. That’s the scary (and potentially ethically-threatening) part of all of this. ESPN Senior NHL Writer Greg Wyshynski noted a “curious” statement from Commissioner Gary Bettman, saying “We have the ability to have input on what’s being bet on.” Whatever input the NHL has on what’s being bet on, fans need to have the confidence to trust them in keeping with the integrity of the game. As the partnership develops and this season unfolds into the next, we’ll have a much better picture of what this deal is all about. As for now, the NHL hopes this deal will garner fanbase growth and increased fan connectivity with the League.